Inspiring Figures is a monthly blog column where I share with you people who are catalysts in inspiring and motivating me. They are people you should really know about. Last month featured Tara, full stack developer working in the start-up scene. You can read her feature here. Just like always, this month’s feature first took place live on Instagram – thank you to everyone that joined in! This month features, Natalie Franke. I first discovered Natalie Franke after speaking to last month’s Inspiring Figure, Tara who brought up the idea during our conversation about the power of community over competition from Natalie’s recent podcast. Since following her, I have been reminded to stay true to my creativity, remain humble with my work and to help others. I hope her message resonates with you! Natalie Franke is a creative entrepreneur and community builder working in the entrepreneurial and technology space with Honeybook and Rising Tide Society. She is passionate about building communities for entrepreneurs, giving them a space to thrive in their work and promote the idea of “Community over Competition”. Initially, she began her journey into this space studying a Neuroscience degree. Natalie has always enjoyed studying the brain and how it perceives the world around us! In order to support her education, she started photographing weddings over the weekends. It got to a point where she had to make the decision of a traditional 9 – 5 job or launch her business full-time. When it got to it, she decided to launch her business, fell in love with it and never looked back. I’m sure that Natalie isn’t the only one that has felt like this during her freelancer journey, but she had begun feeling alone. She didn’t have anyone to connect with, go to and talk to. In the entrepreneurial space, it is thought that everyone else in the space is competition. This sparked a conversation over drinks with Natalie and other creatives of the importance of creating a safe space where working together as one to help everyone reach their potential, rather than pushing people down to get to the top. This is when Rising Tide Society was created. People had started following on Instagram and almost by accident, a huge community was formed. Natalie had thought that the society would be a great summer project, lasting only until the end of summer but it had made waves and the thinking behind the competition, comparing yourself to others and never feeling part of the “cool kids club” changed and quickly spread. At some point in this journey, a technology company called Honeybook acquired Rising Tide Society which had fit their vision of rising creatives together perfectly. Natalie aims to give more time to creatives doing what they love by streamlining processes e.g. invoices using tech tools to guide this! Bring people together away from their computers to have a sit-down, 1-2-1 conversation. Opening up vulnerability recognises that people are all the same, that we are human and we are doing our best. Empathy is key and is truly the way to cultivate a community over competition mindset. Natalie speaks about gratitude a lot on her social media pages, she believes that is so important to cultivate this in our everyday lives if possible. When it gets tough to look at situations from a positive perspective, look into gratitude. By writing 3 things that you’re grateful for just 5 minutes a day can change an outlook for a whole day. An exercise Natalie shared during Inspiring Figures blew my mind. I started this practice myself over the last few days and it has done wonders for my own mental health and perception of the world around me. Take a piece of paper and draw a line in the middle. On one side, write the lies and the fears you feel. On the other side, write an affirmation and things that you’re grateful for in this challenging point in time. Fold the paper in half and read the truth. Focus on this. Natalie shares how during her own dark moments in her life for example going through brain surgery had helped bring her out and keep her going! Passionate about the Women in Entrepership, Natalie ran a report of the Gender Pay Gap in this space and had discovered some interesting findings featured on Forbes and TechCrunch. In this space, although women are setting their own prices, they are still being paid less than their male counterparts for the same work. This has shown that women need empowering to charge more – because they are worth just as much as male freelancers! Natalie also worked on sexual harassment in the freelance world which is so important as a lot of people don’t have protection from HR. This continued to motivate Natalie to push for an industry where people feel represented, secure, safe and supported. She believes that confidence is a huge part of the report and that frameworks from society has cued male and female to behave differently which can have a huge impact further down the line for instance, in work. Boys are socialised into thinking that fine to be aggressive and go after for what he wants, but if girls are aggressive – it’s a big deal. We don’t think about how much it impacts when they are an adult! Although we have a long way to go, things have improved. Male allies have been pivotal in this. The report raised awareness and these male allies have come forward offering help, this is important! It’s not about men vs female, it’s about how can we all create a better world for all of us. 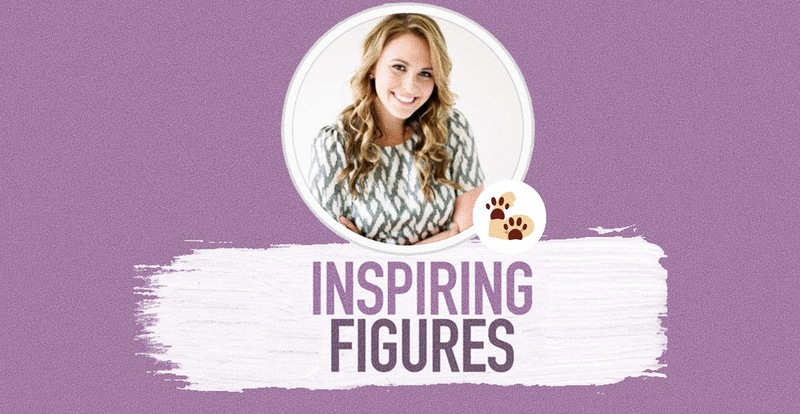 Inspiring Figures is now available on Spotify! Thank you to my brother, Clark Narvas for editing these every month! I had a fantastic time interviewing Natalie for this month’s “Inspiring Figures”, I hope she has inspired you as much as continues to inspire me! You can find her on Instagram, Twitter and contact here on her website here. She sounds like an amazing inspirational woman. I especially like how she isn’t all men vs. women. That’s rare to hear about. I love EVERYTHING that Natalie is about! She is hitting so many important topics and my absolute favorite is her emphasis on creating community and success by bringing each other up. I have never understood the mentality of taking people down to rise up, and it’s clearly so much more effective to provide support and encouragement to each other. I also appreciate her focus on sexual harassment and the norms society has created for each gender. These topics NEED to be talked about in order to create change. A community is definitely needed in those situations. I think it would be something I’d be really keen on if I went freelance full-time! I think it’s great that you do this series, Pauline. The world could always use another inspiring figure, one person at a time. Loved reading about Natalie! Another creative that is really making a good impact on the industry. Nice to see more of this kind of post. Natalie Frankie sounds like a great person! Love it when people are all about raising people. There’s enough room for positive growth and success for everyone, whether it’s at a certain place or another. It’s great that she’s been growing a community and inspiring people to be their best selves. It’s unfortunate that women are paid less than men but this means we need to keep fighting for what’s right.